SINGAPORE: A land parcel at Anchorvale Crescent for an executive condominium (EC) housing development attracted just three bids at the close of the tender on Tuesday (Jan 20), attesting to weaker sentiment in Singapore’s housing market. 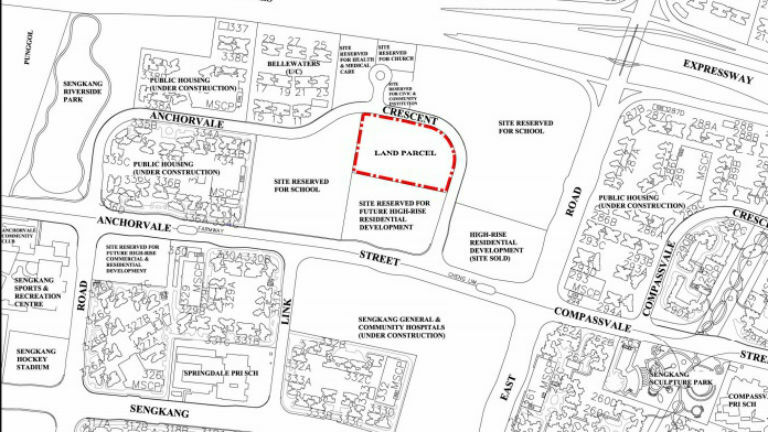 Sim Lian Land submitted the top bid of S$157.8 million for the 17,450.10 square metre 99-year leasehold site, which can be used to develop an estimated 525 dwelling units, the Housing & Development Board (HDB) said in a statement. A decision on the award of the tender will be made after the bids have been evaluated, HDB added. Mr Nicholas Mak, executive director for research & consultancy at SLP International Property Consultants, said the top bid translates to a price of S$280 per square foot per plot ratio – the lowest land price for an EC site since July 2011. He noted that Sim Lian will be able to launch the EC project at S$640 per square foot to S$660 per square foot, undercutting the other launched EC projects in that location. “The number of bids reflects the current sentiment of the EC market, particularly in the Northeast region. It is not surprising given that there are now a record 2,000 vacant EC units that have been launched and remain unsold islandwide as at December 2014,” added Mr Desmond Sim, head of CBRE Research, South East Asia.